Do you have questions about attending one of our auctions? We can help. Check out our auction terms below! 1. Except as otherwise stated, Aaron’s Estate Sales LLC. (Aarons) acts as agent for the seller. The contract for the sale of the property is therefore made between the seller and the buyer. All property is sold as is, and neither Aarons nor any consignor makes any warranties or representation of any kind or nature with respect to the property, and in no event shall they be responsible for the correctness, nor deemed to have made any representation or warranty, of description, genuineness, authorship, attribution, provenance, period, culture, source, origin, or condition of the property and no statement made at the sale, or in the bill of sale, or invoice or elsewhere shall be deemed such a warranty of representation or an assumption of liability. 2. Auctions are open to the public, though Aarons reserves the right to refuse admission or participation to anyone at any time. The auctioneer may be recorded (visually, aurally or otherwise) and all participants consent to such recording. Prospective buyers must register with Aaron's before bidding. Aarons may require identification and financial references in advance of buyer eligibility. Registered bidders accept personal liability to pay the purchase price, including the buyer’s premium plus all applicable charges. 3. Bidding on any item indicates your acceptance of these terms and all other terms printed within, posted, and announced at the time of sale whether bidding in person, through a representative, by phone, by Internet, or other absentee bid. 4. Some lots offered are subject to a reserve. The reserve is a confidential minimum price agreed upon by the consignor and Aarons below which the lot will not be sold. In most cases, the reserve will be set below the estimated range, but in no case will it exceed the estimates listed. A representative of Aaron's will execute such reserves by bidding for the consignor. In any event and whether or not a lot is subject to a reserve, the auctioneer may reject any bid or raise not commensurate with the value of such lot. Lots without reserves are typically opened for bidding at 50% of their low estimate. 5. All property is available for inspection by public preview during the day of auction. Prospective buyers are strongly encouraged to personally examine any property in which they are interested. Buyers are responsible for determining to their own satisfaction the true nature and condition of any lot prior to bidding. Though buyers are not legally required to inspect lots prior to purchase, failure to do so may constitute a waiver of complaint that an item was not delivered in a condition equal to the existent condition at the auction. 6. The buyer agrees to pay the sum of the hammer price plus Buyers Premium, plus any applicable sales tax. Buyers Premiums are calculated as follows: Floor or Absentee Bidding: Buyers Premium of 15% (of hammer price) when paying by cash, check or wire transfer or 18% when paying by credit card. Bidding through internet platform or Telephone: Buyers Premium of 15% when paying by cash, check or wire transfer or 18% when paying by credit card. Buyers outside the United States must submit payment via wire transfer. Buyers are strongly encouraged to provide full payment at the auction. Payment must be received by Aaron's within the three business days immediately following the auction. The buyer shall not acquire title or take possession of the lot until all amounts (including the hammer price, premium and applicable taxes) due to Aaron's have been paid in full. 7. The highest bidder as determined by the auctioneer shall be the purchaser. In the case of a disputed bid, the auctioneer shall have sole discretion in determining the purchaser and may also, at his or her election, withdraw the lot or reoffer the lot for sale. The auctioneer shall have sole discretion to refuse any bid, or refuse to acknowledge any bidder. 8. Aaron's offers absentee, telephone and internet bidding as a convenience to clients and does not accept liability for errors or failures to execute such bids. Absentee and telephone bids must be recognized by Aarons prior to auction day. When identical absentee bids are submitted that become the highest bids at the auction, the bid first received by Aaron’s shall be accepted as the winning bid. Telephone bidders are encouraged to leave minimum bids in case of technical failure. 10. All merchandise purchased must be paid for and removed from the premises the day of the auction. Aarons shall have no liability for any damage or loss to property left on its premises for more than three (3) days from the date of sale. 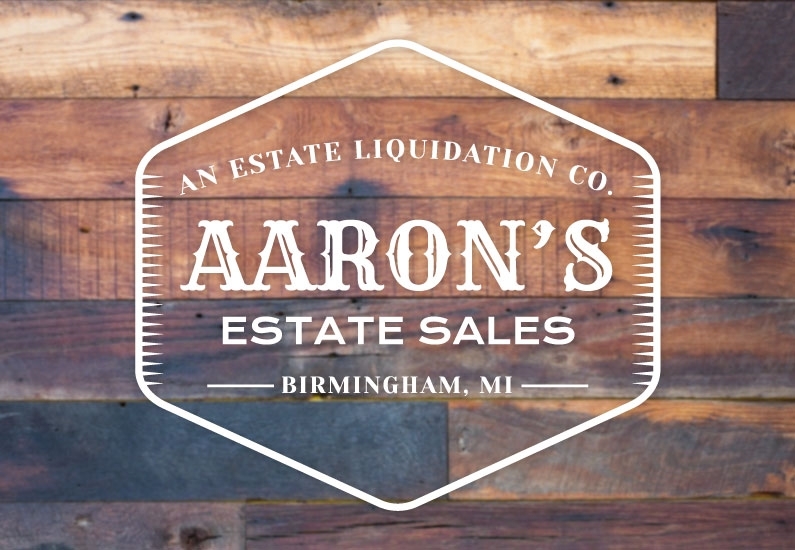 If any property has not been removed within three (3) days from the date of sale, Aaron’s may impose, and the purchaser agrees to pay, a weekly storage charge of 1.5% of the purchase price of any lot or portion of a lot not removed within the three days, and/or Aaron’s may place the merchandise in a subsequent auction, without Reserve, to be sold to the highest bidder, and after deducting the standard commission and any additional charges that may apply, remit the proceeds to the purchaser. 11. Winning bidders are responsible for all costs to ship their items. Upon request, our staff will provide the list of shippers who deliver to destinations within the United States and overseas. Some property that is sold at auction can be subject to laws governing export from the U.S., such as items that include material from some endangered species. Import restrictions from foreign countries are subject to these same governing laws. Granting of licensing for import or export of goods from local authorities is the sole responsibility of the buyer. Denial or delay of licensing will not constitute cancellation or delay in payment for the total purchase price of these lots. 12. Notwithstanding other terms mentioned herein, refunds shall be given at Aarons sole discretion. Refunds requested on the grounds of authenticity must be made within 10 days of the auction and accompanied by a supporting written statement from a recognized authority (defined as a person who has authored, edited, or substantially contributed to a monograph on the artist, a person who has curated, organized or substantially contributed to a solo exhibition on the artist, a person who has represented the artist’s estate or someone who represented or worked closely with the artist while they were alive and, in any of the above instances physically handled works of the period, medium and subject matter in question during the course of their duties) stating that the object sold is incorrect or not the work of the artist. Dealers, appraisers and representatives of other auction firms do not qualify as authenticators of individual artists unless they have had such specific involvement with that artist’s work, as specified above, in addition to their daily duties. Refunded lots must be returned to Aaron’s in the same condition as when sold. Aaron’s does not grant extensions to refund considerations based upon authenticity due to shipping delays. There are no exceptions to this refund policy. 13. If the purchaser breaches any of its obligations under these Conditions of Sale, including its obligation to pay in full the purchase price of all items for which it was the highest successful bidder, Aaron's may exercise all of its rights and remedies under the law including, without limitation, (a) canceling the sale and applying any payments made by the purchaser to the damages caused by the purchaser’s breach, and/or (b) offering at public auction, without reserve, any lot or item for which the purchaser has breached any of its obligations, including its obligation to pay in full the purchase price, holding the purchaser liable for any deficiency plus all costs of sale. 14. In no event will the liability of Aaron's to any purchaser with respect to any item exceed the purchase price actually paid by such purchaser for such item. 15. Sales in Michigan are subject to the respective current sales taxes. Dealers, museums, and other qualifying parties may be exempt from sales tax upon submission of proper documentation. 16. Aaron's and its consignors make no warranty or representation, express or implied, that the purchaser will acquire any copyright or reproduction rights to any lot sold. Aarons expressly reserves the right to reproduce any image of the lots sold in this catalog. The copyright in all images, illustrations and written material produced by or for Aarons relating to a lot, including the contents of this catalog, is, and shall remain at all times, the property of Aaron's, and shall not be used by the purchaser, nor by anyone else, without our prior written consent. 17. These Conditions of Sale shall be governed by the laws of the State of Michigan (excluding the laws applicable to conflicts or choice of law). The buyer/bidder agrees that any suit for the enforcement of this agreement may be brought, and any action against Aarons in connection with the transactions contemplated by this agreement shall be brought, in the courts of the State of Michigan or any federal court sitting therein. The bidder/buyer consents to the nonexclusive jurisdiction of such courts and waives objections that it may now or hereafter have to the venue of any such suit.